Chiwaukee Prairie’s Krampert Trail is rich in Carex species that were collected from 2007-2013 with permits from Wisconsin Department of Natural Resources, The Nature Conservancy and The University of Wisconsin-Parkside. Part of a previous research, Carex of the Zion beach-ridge plain, new species have since been discovered and vouchered. Note: In 2018, new property on the west was purchased and a new inventory will be made for plants on the Holocene Ridge. Chiwaukee Prairie has 410 acres of the northern portion of the 18-mile long Zion beach-ridge plain along Lake Michigan in the southeastern corner of Kenosha County, Wisconsin bordering the Illinois state line. During the years 2007–2013, species of Carex, family Cyperaceae, were collected from the entire beach plain; scanned and micro-imaged; and then sent to herbaria at UW-Milwaukee (UWM), UW-Madison (WIS), and Morton Arboretum (MOR). The purpose of this research was to collect Carex at Chiwaukee Prairie and verify the existing inventories by checking on vouchers in herbaria and to add new species. Although plant inventories were on websites of Chiwaukee.org and Wisconsin Department of Natural Resources, a search of many herbaria did not find these: C. aquatilis, C. crawei, C. meadii, and C. richardsonii. The plants were collected and added to herbaria including newly discovered C. suberecta and C. siccata, thus providing a verified new inventory. Chiwaukee Prairie in Pleasant Prairie extends from the Kenosha Dunes on the north to the border with Illinois. Geographically it is the northern part of the Zion beach-ridge plain that is a narrow erosion-deposition plain of sand and gravel formed by declining water levels on the west coast of Lake Michigan over the past 3,600 years. This Lake Michigan plain is a migratory landform that has narrowed in the past century by erosion of the beach sand and gravel, and slowly advanced southward. Chiwaukee Prairie’s foredune and parts of First Avenue eroded away and the upper beach has since been armored with limestone slabs to prevent further erosion. Although Carex species did not grow in the upper beach near the armored area, a few grew in the dry sand prairie along Lakeshore Drive that did not have a soil horizon. Carex also grew in the older mesic prairie further inland that had developed a soil horizon. Most of the Carex species grew in the wet prairies, sedge meadows, and emergent marshes that often dried in summer, depending on rainfall and lake levels. The three prairie habitats, oak savannas, and wetland habitats supported different plant associations. 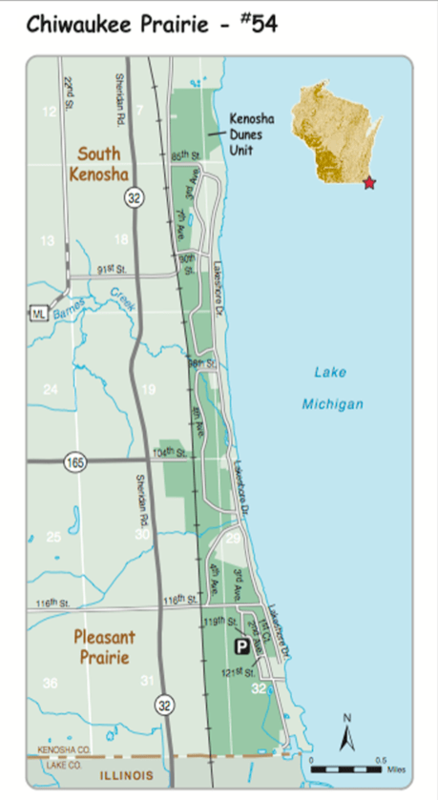 Those were similar but not identical, to other sites in Illinois on the Zion beach-ridge plain that include Spring Bluff Forest Preserve, Illinois Beach State Park, Zion’s Hosah Park, and Waukegan Dunes (Table 8). Fig. 2. Aerial map from 116th St on left, south to Wisconsin-Illinois border. Carex species at Chiwaukee Prairie were listed on the WDNR website www.dnr.wi.gov and also on www.Chiwaukee.Org. Online herbaria provided proof of species present as vouchered specimens that were examined, annotated or verified by other botanists. The purpose of this field research was to collect Carex and verify the lists by existing vouchers and also add new species as herbarium specimen vouchers to the inventory. Figure 3. Screen captures: WDNR, left, 28 species and Chiwaukee.org, right, 26 species. Permits to collect Carex culms were sought annually from the WDNR, TNC, and UWP. Fertile culms of Carex were collected, scanned and micro-imaged, and then identified using Carex manuals, websites, and herbaria virtual images. Since the WDNR and Chiwaukee.org lists differed, several Midwest herbaria websites were searched to find vouchered specimens. Since specimen labels often give locations, researchers usually find the plant population again. What is a voucher and why is it important in research? As a preserved specimen of an identified taxon deposited in a permanent and accessible storage facility, the voucher serves as the supporting material for published studies of the taxon and ensures that the science is repeatable. Vouchers are crucial in authenticating the taxonomy of an organism, as a tool for identifying localities of the taxon, and for additional taxonomic, genetic, ecological, and/or environmental research (Culley 2013). The Wisconsin Botanical Information System www.botany.wisc. edu/wisflora is an online database of Wisconsin herbarium with records of vascular plant species that may be either searched or browsed. Browse fields are Families, Genera, and Common Names. Choose genera and Carex or go to: http://www.botany.wisc. edu/cgi-bin/GenusList.cgi. Search fields are Name, Habitat, Status, and County. Any of the counties shown on the map of Wisconsin can be selected for records of any species. Plant lists may be accessed using the values – family: Cyperaceae, and genus: Carex, species (epithet) of interest. Select “View Herbarium Records” to view records selected by column headings. Accession numbers given to catalog incoming specimens are listed in Table 7 with their acronym. Herbaria acronyms were University of Wisconsin-Milwaukee UWM, University of Wisconsin-Madison WIS, and University of Wisconsin-Steven’s Point UWSP. Another is vPlants.org, the Virtual Herbarium of the Chicago Region that has combined data of the Morton Arboretum MOR, Field Museum F, and the Chicago Botanic Garden CBG. The earliest vegetation analysis of southern Wisconsin prairies that included Carex was by Iltis and Zimmerman (1962). Hugh Iltis collected eight Carex in addition to other native plants at the Chiwaukee Prairie for The Nature Conservancy: C. buxbaumii, C. conoidea, C. pellita, C. sartwellii, C. sterilis, C. stricta, C. viridula, and C. umbellata. Theodore Cochrane collected seven in 1985, picking up C. bebbii, C. granularis var. haleana, and C. muehlenbergii, but not C. sartwellii and C. sterilis, and C. umbellata that Iltis found. Specimens are held at the University of Wisconsin herbarium WIS.
Also at WIS are Carex collected by Peter Hujik in 1993 for his study on the ground layer of lowland oak savannas in Wisconsin prairies that included Avoca Prairie in Iowa County and Chiwaukee Prairie in Kenosha County. Voucher specimens sent to WIS collected from Chiwaukee Prairie were C. atherodes, C. conoidea, C. granularis var. haleana, C. pellita, C. pensylvanica, and C. stricta (Hujik, 1993). Eugene Gasiorkiewicz from UW-Parkside compiled an inventory in 1986 using the Iltis and Zimmerman 1962 checklist. Chiwaukee Prairie Preservation Fund (CPPF) also used that inventory on its website www.chiwaukee.org. Data from herbaria with Carex specimens from Kenosha County and Chiwaukee Prairie are in Tables 1–6. Table 1 lists Carex species from The Wisconsin Botanical Information System WBIS had 54 specimens of 35 Carex species from Kenosha County that included species from woodlands, bogs, marshes, roadsides, dry-wet sand prairies, wetlands and savanna. Table 2 lists only the 14 Chiwaukee Prairie species at University of Wisconsin-Madison Herbarium WIS. Table 3 has Kenosha County specimens of 50 Carex species at Morton Arboretum MOR and Table 4 has only the Chiwaukee Prairie 21 species at MOR. Table 5 has fewer specimens from Kenosha County and Chiwaukee Prairie at the UWM herbarium. Table 6 lists Carex that are Plants of Concern POC. Table 7 includes all vouchered specimens, numbers, and acronyms of the herbaria of deposit, including some processed from this research. (Table 8) is an updated list from the Zion beach-ridge plain, now 54 species. Kenosha County Carex (Table 1) has an earliest collection date for C. swanii in 1900 and C. vesicaria, C. cristatella, C. emoryi, and C. trichocarpa from1901 but none were from the Chiwaukee Prairie. Sixty years later, 1961-64, Hugh Iltis collected 10 Carex species in several sites in Kenosha County with Jim Zimmerman for the Nature Conservancy Inventory, including Chiwaukee Prairie (Table 2). In 1965 Floyd Swink collected in various habitats within Kenosha County for his book “Plants of the Chicago Region”. Six of the specimens in Kenosha County 1973–74 were vouchers from Benedict Prairie for UWM M.S. Botany Thesis (Curtis, 1974). UWM major professor Dr. Phillip Whitford, a former student of University of Wisconsin’s John Curtis (1957), encouraged comparing Carex species from Benedict Prairie that had clay soils to species in sand prairies. His research at the Benedict Prairie found only C. bicknellii in the railway in his quadrats (Whitford, 1958), but no voucher was found. In 1973-74 I found similar C. molesta but not C. bicknellii in the revegetated railway. Seven Carex species that grew in clay soil at Benedict Prairie also grew in Chiwaukee Prairie’s sand prairies: C. buxbaumii, C. pellita, C. molesta, C. sartwellii, C. siccata, C. stricta, and C. vulpinoidea. Table 2 WIS has 16 species from four collectors at Chiwaukee as of Dec 31, 2013. MOR had 12 Carex from Chiwaukee Prairie in their Database in November 2013 and 22 species cataloged by end of Dec 2013, and more to be labeled (Table 4). Ten new Chiwaukee Prairie specimens were from UW-Parkside Herbarium UWP and were verified by Gerould Wilhelm and given accession numbers. Three specimens from Chiwaukee Prairie collected in by 2013 by curator Dr. Andrew Hipp were entered but not numbered are: C. gracillima, C. molesta, and C. scoparia. C. molesta was new to Chiwaukee Prairie but was collected in 2011 farther south on the Zion beach-ridge plain and now at Illinois State Museum ISM(Curtis 2013). Chi = Chiwaukee Prairie Ben = Benedict Prairie, a field station of UW-Parkside (Curtis, 1974). Collector Albert M. Fuller was the curator at the Milwaukee Public Museum and planned the Statewide Museum Project 1937-39 to collect plants. The UW-Stevens Point Herbarium UWSP has 40 Kenosha County Carex species. Although omitted as a table here, it has different species than WIS and MOR from Chiwaukee Prairie. Robert Freckmann collected C. buxbaumii and C. sterilis for UWSP while C. muehlenbergii, C. pellita and C. sartwellii were for WIS (Table 1). The earliest inventory for Chiwaukee Prairie had 26 Carex species and was compiled by UW-Parkside by Eugene Gasiorkiewicz in mimeograph form in 1986 and used the Iltis and Zimmerman’s collection data from 1962. It was used by Lori Artiomow in 2010 for the POC website www.plantsofconcern.org (Table 6). Lists differ from the new URL “dnr.wi.gov” compared to Chiwaukee Prairie Preservation Fund’s www.chiwaukee.org website. Wisconsin’s DNR list had C. adusta, C. lasiocarpa, and C. schweinitizi that were not on the chiwaukee.org website. Conversely, WDNR did not list C. meadii, and C. haydenii. The Chicago Botanic Garden and Chiwaukee Prairie Preservation Fund’s Plants of Concern POC website list includes C. conoidea, C. crawei, C. cryptolepis, C. umbellata and C. viridula on the watch list for southern Wisconsin and Illinois (Table 6). C. richardsonii, UPL and C=10, as was found during this research and POC may re-list it on the watch list. Table 6 also shows the numerical value of the species ranked 1-10 in the Chicago Region portions of Illinois, Indiana, Michigan and Wisconsin (Swink & Wilhelm, 1994). For the entire state of Indiana, the numbers are different, added to show differences (Rothrock, 2004). The species most tolerant or with preference for disturbance are the lower numbers 0-3. The highest numbered 8-10 species grow in specific natural habitats and do not survive disturbance. Species in an area are used to calculate a Coefficient of Conservation, a number indicating how pristine or disturbed the area based on its flora. Plants are categorized as growing in wet to dry habitats. Obligate wetland plants, OBL, grow in perennially wet or hydric soils. Obligate wetland species were C. aquatilis, C. bebbii, C. buxbaumii, C. diandra, C. hystericina, C. pellita, C. sterilis, C. stricta, C. viridula, and C. vulpinoidea (Swink and Wilhelm, 1994). The natural habitats in the depressions include marshes, sedge meadows, wet prairie, creeks and ponds. Rhizomatous C. aquatilis grew along and over a quicksand creek flowing to Lake Michigan. In marshy swales, C. buxbaumii grew with C. pellita and C. stricta. C. vulpinoidea grew along a weedy and wet dead-end road along WDNR lots north of 116th St. C. suberecta, OBL and C=8, was discovered in 2011, and grew along side of 122nd Street, a rutted road, that runs to the railway. The specimen was not found again after a wide roadside mowing in 2013. Other obligate wetland species that were not found and likely in the wetlands were C. diandra, C. hystricina, and C. sterilis. C. viridula, not in the WDNR list, grew along a water-filled roadside ditch at 1st Court near former 117th St and 2nd Ave.
FACW species grow in wetlands and wet areas that are often drier during the summer. These are C. conoidea, C. crawei, C. granularis, C. normalis, C. prairea, C. sartwellii, C. tetanica, and C. tribuloides. Not found were C. normalis, C. prairea, and C. tribuloides. However, C. granularis var. haleana grew in disturbed soil along the rut road on 122nd Street near the railway. A separate species C. haleana in Illinois (Mohlenbrock 2011), Michigan and Wisconsin list that instead as a variety. Rare FACW Carex not yet found at Chiwaukee Prairie are C. aurea and C. garberi but are known from other sites on the Zion beach-ridge plain. Associates C. crawei, C. conoidea and C. tetanica grow in Chiwaukee Prairie and in wet calcareous prairies and sedge meadows in southeastern Wisconsin (Hipp, 2008). Six Carex that grew along a WDNR marsh on 4th Avenue north of 116th Street were: C. buxbaumii, C. meadii, C. pellita, C. sartwellii, C. stricta and C. viridula. Farther south, the gated 122nd Street, also known as the Olsen Trail, ends at the railway near N42 30.015 W87 48.992. There C. granularis var. haleana, C. umbellata, and C. pensylvanica grew in sand oak woods savanna in partial shade. Farther along the railway in dry sand prairie were C. siccata and C. brevior. Although a mature C. muehlenbergii, (previously C. muhlenbergii), was not found during this research, Wilhelm & Schulenberg had collected a specimen along the railway on 7/3/1975 that is vouchered as MOR7709 (Table 7). Other UPL or upland species in oak savannas were C. siccata and C. pensylvanica. C. pensylvanica var. digyna is now C. inops var. heliophila in FNA Vol. 23, but is species ranked as C. heliophila in Flora of Illinois: Carex, 2011. University of Wisconsin Herbarium WIS has C. inops L. H. Bailey subsp. heliophila specimens, but not for counties of Kenosha, Racine. However, C. pensylvanica specimens at Chiwaukee Prairie had two forms, one with short acute staminate scales and another with long scales on the terminal staminate spike and larger perigynia. Michigan Flora lists the latter as C. inops var. heliophila (Voss & Reznicek, 2011). A morel mushroom was photographed ground-level in early May and a small tuft of C. umbellata aside the mushroom became conspicuous in the macro-lens view, a sudden discovery of a sought-after species. Small species were found while searching on hands and knees close to the ground, otherwise missed when standing. Tufts were finger-combed to find hidden or basal spikes. The rare C. tonsa was photographed in bloom, but not found as a mature plant. Similar to C. umbellata, both have small tufts with hidden basal spikes. C. tonsa has larger perigynia with longer beaks than C. umbellata. Ovales, the group with flat winged perigynia and stamens in the lower scales of multiple small spikes, are known to change seed head form and either elongate or cluster more on their culms later in the season (Voss & Reznicek, 2011). C. bicknellii, on the website lists, were not found in the field or at herbaria for Chiwaukee. That species has large perigynia 5–7 mm, translucent over the achene and long veined on both faces. Similar C. brevior was repeated found and had perigynia 3–4 mm long x 2.5–3.3 mm wide, and veinless on the inner face. Similar C. festucacea has perigynia nearly 4 mm long, so its narrower width of 2.4 mm or less was diagnostic in keying species since both C. brevior and C. bicknellii’s perigynia are wider. C. brevior has perigynia 2.5–3.5mm wide while C. bicknellii’s are 3–5 mm wide (Voss & Reznicek, 2011). C. bicknellii was on the checklist for adjoining Spring Bluff Forest Preserve in Lake County, Illinois (Curtis, 2012) but no vouchers were found, although both WDNR and chiwaukee.org had C. bicknellii listed. C. molesta does have perigynia to 5.5 mm long and is that likely species. C. meadii and C. tetanica vary morphologically in the harsh environment along the Lake Michigan coast. A robust C. tetanica could fit the description of C. meadii that is a slightly larger plant of the Midwest plains. Early blooming specimens were checked for length of anthers on the stamens of C. meadii were 4 mm long fresh and dried to 3.2 mm while C. tetanica’s were 3 mm fresh and less when dry. Chiwaukee Prairie has mostly C. tetanica. The key in the Field Manual of Michigan Flora (Voss & Reznicek, 2011) differed from Flora of Illinois: Carex (Mohlenbrock, 2011). Some specimens that appeared as C. meadii were checked for achene width. C. meadii’s achenes were 1.7–2.2 while C. tetanica’s were smaller as 1.2–1.6 mm wide. A good field clue, C. meadii’s ligules were wider than long, forming an arch to half moon, while legumes of C. tetanica were as long as wide to longer than wide, forming an ellipse. Also problematic, some C. stricta had long red scales and were similar to C. haydenii. The Morton Arboretum provided perigynia from their C. haydenii specimens that were rounder-shouldered and plumper than those of the Chiwaukee Prairie specimens. The C. haydenii sent to UWM may be annotated as C. stricta. C. richardsonii grew in Plot 25 of the POC map, south of 116th St. but north of the 2nd Ave and Al Krampert Trail street sign. An early bloomer and collected mature in May, the stamens and stigmas appeared in April but were shed before May. No herbaria vouchers of C. richardsonii were found during online searches 2007-2013 although both the WDNR and chiwaukee.org websites listed it (Figure 3). Species collected along the Krampert trail were C. buxbaumii, C. crawei, C. conoidea, C. meadii, C. tetanica and C. stricta. Also a deer trail, wood ticks were abundant. Species collected that were not on the WDNR website for Chiwaukee Prairie, were C. brevior, C. siccata and C. suberecta and only C. brevior was vouchered. Others without vouchers were: C. bicknellii, C. festucacea, C. lasiocarpa, and C. stipata. C. stipata and C. muehlenbergii were seen along 122nd St. but that roadside was widely mowed the following year before the plants matured. C. flava was collected by Swink in 1953 and annotated to C. viridula in 2007. C. cryptolepis has not been collected in Chiwaukee or on the Zion beach-ridge plain but was discovered farther south in Montrose Harbor in Chicago (Milde, 2013). C. viridula has yellow-green perigynia, 2–3 mm long. C. flava has bright yellow perigynia, 4–6.3 mm long while C. cryptolepis has yellow-green perigynia 3.2–4.5 mm long (Mohlenbrock, 2011). 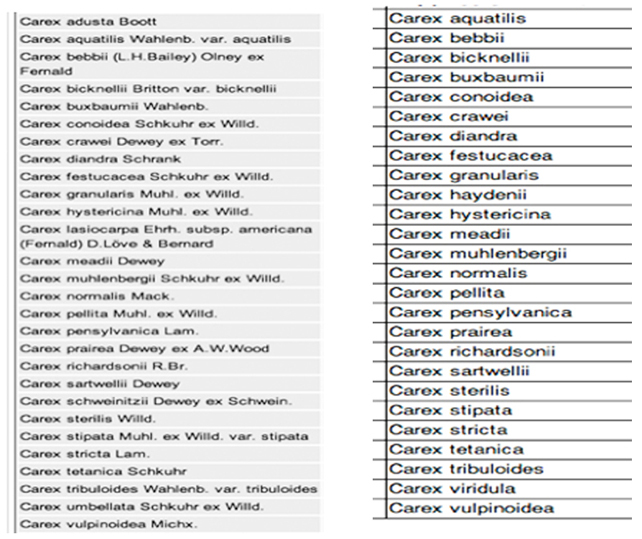 The Carex species in the list from www.chiwaukee.org that were not collected during this research were 16 species: C. atherodes, C. bebbii, C. bicknellii, C. diandra, C. festucacea, C. flava, C. hystericina, C. muehlenbergii, C. normalis, C. prairea, C. retrorsa, C. sterilis, C. stipata, C. tenera, C. tonsa and C. tribuloides. Four of these species were in herbaria as vouchered specimens: C. atherodes, C. muehlenbergii, C. prairea and C. sterilis. Species not found from WDNR list were: C. adusta, C. bebbii, C. bicknellii, C. diandra, C. festucacea, C. hystericina, C. lasiocarpa, C. normalis, C. schweinitzii, C. stipata, and C. tribuloides. C. adusta, C. bicknellii, and C. schweinitzii are dubious. Species on former lists may have been recorded during field research and data sampling (quadrant or transect) but not collected. Species from lists without vouchers were C. bicknellii, C. diandra, C. festucaea, and C. richardsonii, but may be in other herbaria or private collections. The specimen of C. richardsonii found in this research in 2010 is now vouchered at both UWM and MOR. This research provided 18 species for herbaria, two new* to prior inventory lists. C. aquatilis, C. brevior, C. buxbaumii, C. conoidea, C. crawei, C. granularis var haleana, C. meadii, C. pellita, C. pensylvanica, C. richardsonii, C. sartwellii, C. siccata,*C. stricta, C. suberecta,*C. tetanica, C. umbellata, C. viridula and C. vulpinoidea. The 18-mile long Zion beach-ridge plain has 54 species since C. flava was annotated as C. viridula (Table 8). Species from other sites on the Zion beach-ridge plain that were not found at Chiwaukee were: C. annectens var xanthocarpa, C. aurea, C. blanda, C. comosa, C. cephalophora, C. cristatella, C. garberi, C. grisea, C. inops var heliophila, C. interior, C. lacustris, C. laxiflora, C. retrorsa, C. rosea, C. tenera and C. sparganioides. This is a potential search list for other species yet to be discovered. C. tenera was in the Spring Bluff inventory column but was not on either the WDNR Natural Area #54 species list nor the Chiwaukee Prairie Preservation Fund list on Chi.org. Although found in Kenosha County, no Chiwaukee vouchers were found and C. tenera was removed from the Chiwaukee column in the Zion beach-ridge plain Table 8. Spring Bluff has a checklist but not vouchered species. Table 8 acronyms are IBSP = Illinois Beach State Park. CHI = Chiwaukee Prairie. SB = Spring Bluff, a Lake County Forest Preserve. W = Waukegan Dunes. H = Zion’s Hosah Park col. 2013 . Rare C. tonsa was photographed at Chiwaukee Prairie by POC Lori Artiomow, but no specimen was taken. (Artiomow, 2007). Search for a mature specimen continues in Plot 1 of the POC map north of the state border, west of Prairie Cove Harbor Marina and near the western railway border. The tables with collection dates indicate the best time to identify mature seed heads in the field. However, the keys for identification in manuals were devised from characteristics of dried mature specimens that appear different from than fresh plants. The window of opportunity for keying mature fresh specimens may be within a few weeks, but the sedge season of different species maturation is April-October. Current studies on phenological shift caused by global warming may use vouchers as proof of blooming or maturity data changes. (Denslow, 2008). 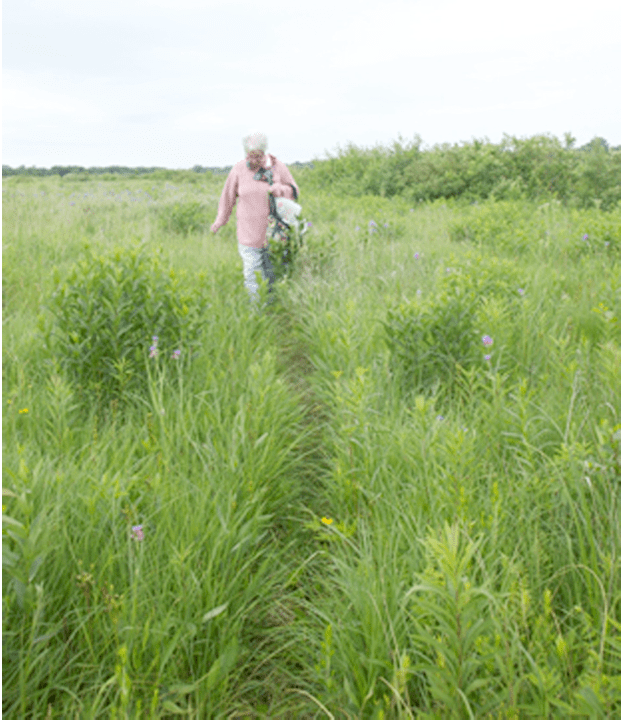 A more accurate inventory of the Chiwaukee Prairie Carex species was determined after six years of field research with 18 species collected as vouchers and sent to herbaria. Specimens were given accession numbers by herbaria UWM, WIS, and MOR. Online herbaria searches resulted in a list of 29 vouchered species including 18 of this research. New Carex species collected that were previously not vouchered were C. aquatilis, C. crawei, C. meadii, and C. richardsonii, plus new C. suberecta and C. siccata. Thanks to Nick Miller and Stephanie Judge of The Nature Conservancy, Tom Meyer of WDNR, David Rogers of UW-Parkside, Bethany Brown from the Morton Arboretum Herbarium and curator Andrew Hipp who also collected at Chiwaukee Prairie. Also thanks to Mark Wetter and Ted Cochrane at UW-Madison Herbarium, and Sara Hoot and Keir Wefferling at UW-Milwaukee Herbarium, and Tori Graham of the Chiwaukee Prairie Preservation Fund. Also thanks to Lori Artiomow, Susanne Masi and Rachel Goad of Plants of Concern. I appreciate Merel Black who entered my Chiwaukee Prairie images on the Robert Freckmann Herbarium UWSP website. Last, Gerould Wilhelm, thanks for your pursuit of small herbaria and annotations of Carex. Artiomow, L. Personal Communication. Plants of Concern monitoring Chiwaukee. 2007. Ball, P. W. and A.A. Reznicek. Eds. Cyperaceae. Flora of North America, Volume 23: 254–573. New York: Oxford University Press. Curtis, L.W. 1974. A vegetation analysis of Benedict Prairie, Kenosha County, Wisconsin, Master’s thesis, UWisconsin-Milwaukee. www.curtistothethird.com. Curtis, L.W. 2013. Carex of the Zion beach-­ridge plain. Erigenia: Journal of the Illinois Native Plant Society. No. 26, p 15–25. Denslow, Michael 2008. Herbarium specimens in support of global change research. Reticulum Austro-orientale, SERNEC Newsletter, Appalachian State University, Boone, North Carolina. Gasiorkiewicz. E. 1986. Chiwaukee Prairie Plant Checklist. Mimeo. University Wisconsin- Parkside, Kenosha, Wisconsin. Gleason, H. A. and A. Conquist 1991. Manual of the vascular plants of the northeastern United States and adjacent Canada. 2nd. New York: New York Botanical Garden. Hipp, A. 2008. Field Guide to Wisconsin Sedges. University of Wisconsin, Madison. Hipp, A. L. 1998. A checklist of carices for prairies, savannas and oak woodlands in southern Wisconsin. Transactions of the Wisconsin Academy of Sciences, Arts, and Letters 86:77-99. Hujik, P. 1993. Lowland oak savannas: Groundlayer composition and distribution in relation to light and soil moisture. 1993 Proceedings of the Midwest Oak Savanna Conferences. USEPA. Iltis, H. H. n.d. 1962. The Benedict prairie in Kenosha County, Wisconsin. Mimeo. WisC. Chap. TNC, Proj. No. 3. Dept Bot., Univ. of Wisconsin. Kline, V. M. 1989. The Nature Conservancy saving biodiversity. P. 28. Wisconsin Academy Review. Milde, Margo. 2013. Personal communication. Plants of Concern. Rare plant monitoring. Chicago Wilderness and Chicago Botanic Garden. www.plantsofconcern.org. Sander, P. 1969. Kenosha Sand Dunes. Wis. Acad. Review 16 (3):2-6. Swink, F. and G. Wilhelm. 1994. Plants of the Chicago region. 4th ed. The Morton Arboretum, Lisle, Illinois. Voss, E.G., A. A. Reznicek, 2012. Field Manual of Michigan flora, University of Michigan Press, Ann Arbor. Image of Carex buxbaumii, the most conspicuous and the most frequently collected sedge in the wetland prairies. Formerly Weyhe Prairie, Chiwaukee Prairie was platted for development when acquired by the Nature Conservancy in 1967 and increased by purchase of lots. On the north, Kenosha Dunes at N42 40.000 extend from 85th to 80th Street in Kenosha. The western boundary, Union Pacific railway, is at W87 49.024. Wisconsin Dept. of Natural Resources owned 308 acres north of 116th Street near Carol Beach. South of 116th Street, The Nature Conservancy (TNC) owned 196 separate tracts or 149.52 acres that extended to the Illinois border. In 2011, TNC added 4.42 acre Barnes Prairie to the holdings. University of Wisconsin-Parkside (UWP) and Village of Pleasant Prairie (VPP) also own about 100 acres within Chiwaukee Prairie. The unmarked southern border is almost a mile wide from railway to Lake Michigan shore at the Wisconsin-Illinois State line. It is aside Prairie Harbor Marina at 126th to 128th Street, numbered from Kenosha. Just below the Illinois border, Russell Road becomes 1st Street east of Sheridan Road and ends at the west side of the railway with no access across. The entry to the Illinois Beach State Park’s North Point Marina in Winthrop Harbor is from 7th Street. North Point dunes In Illinois are being restored with transplants by the Lake County Forest Preserves, including Carex. Spring Bluff, a Lake County Forest Preserve, is also adjacent to Chiwaukee Prairie’s southern border and the railway is also the western boundary. Spring Bluff has no dunes as it is on is on the western side of Winthrop Harbor’s North Point Marina. Spring Bluff has 31 Carex species, check listed but not vouchered, most species in marshes and low ridges. Although Spring Bluff and the adjacent Illinois Beach State Park have many Carex species in common, some were exclusive to their sites. 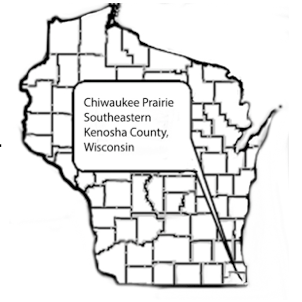 Chiwaukee Prairie has four major ownerships plus private lots. WDNR properties are north of 116th beginning near 4th Avenue and extend north through the Kenosha Dunes. Recently The Nature Conservancy donated its properties south of 116th Street to the State of Wisconsin, and ownership will pass to WDNR in 2014. The University of Wisconsin-Parkside’s property extends from 116th to 122nd Street, plus some individual lots. The Village of Pleasant Prairie owns property that includes a seasonal pond and island in a former golf course platted in 1925. Two ponds were created originally, but the pond north of 122nd Street filled in naturally. The railway on the western border follows the geologic Holocene bluff known as the Zion ridge or old Lake Chicago bluff. The width of Chiwaukee Prairie from the Lake Michigan coast to the railway on the west is almost ¾ of one mile at 116th Street. Lakeshore Drive is now discontinuous and partly eroded away. Some former homes on the coast collapsed or were removed while some still exist. Lakeshore Drive continues to 127th Street, the private Prairie Cove Marina and the nearby but unmarked Illinois border between two ponds and Skipper Bud’s Marina in Illinois.